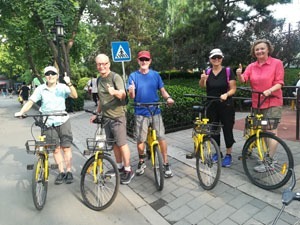 If you are excited about walking through the history-filled and lively streets of Beijing, the following two walking routes should interest you. Explore the most popular lanes in Beijing. See a traditional siheyuan, which used to be the former residence of socialites. Experience the Chinese temple culture. This walk is a journey back to the Yuan Dynasty (1271–1368), when the earliest settlements were built in this area. The settlements constituted the earliest hutongs (/hoo-tongs/) and siheyuan (/srr-her-ywen/), traditional courtyard houses. 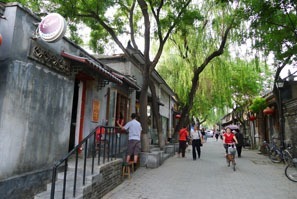 800-meter-long Naluoguxiang Hutong (南锣鼓巷 /nan-lwor-goo-sshyang/) is known for its authentic Beijing atmosphere. 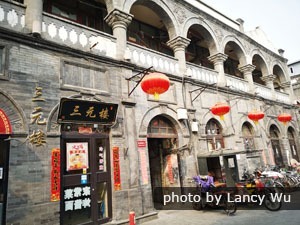 Centuries-old siheyuan, archways, wall carvings, and former residences of socialites can be found there. Today there is an unprecedented fusion of East and West in Nanluoguxiang, where new pubs and restaurants have given it a cosmopolitan appearance. Walking down the ever-bustling hutong for about 300 meters, a siheyuan numbered 15 Nanluoguxiang will begin to appear at one side of the lane. Otherwise known as Ke Yuan (可园 /ker-ywen/), this past residence of Wen Yu, a scholar in the Qing Dynasty (1644–1911), has been regarded highly for its artistic value. Wen Yu was a high-ranking government official, and he took up various important positions during his life. He spent a large proportion of his financial assets on building the Ke Garden, which covers an area of 5 courtyard houses from No. 7 to No. 15 on Nanluoguxiang (all odd numbers). Ke Garden was built with an arrangement similar to that of Humble Administrator&apos;s Garden and Lion Grove Garden in Suzhou. The intricate architecture and elaborate decorative details were meticulously arranged, the pavilions and man-made hills were skillfully crafted, reflecting unusual elegance. Such a graceful garden is rarely found in a Beijing hutong. 1. Head west along Di&apos;anmen East Street for 220 meters. 2. Turn right and head straight for 70 meters before turning left. 3. Walk straight for 10 meters and turn right. 4. Turn left after heading straight for 190 meters. 5. Turn left on Mao&apos;er Hutong after heading straight for 100 meters. 6. Turn right on Di&apos;anmenwai Street after walking along Mao&apos;er Hutong for 230 meters. 7. Head straight for 390 meters to reach the Drum Tower. Mao&apos;er Hutong is a notable hutong in this segment of the route. It is has been named one of the "10 Most Famous Hutongs in Beijing". Wan Rong, the last queen of China&apos;s imperial past, is believed to have grown up there. Situated at the heart of Beijing, Mao&apos;er Hutong housed many historical buildings, some of which were were well-known socialites&apos; residences, or have served significant political purposes. The Drum Tower is located at the northern end of the central axis of the Inner City, to the north of Di&apos;anmen Street. It was originally constructed for drum performances, and later transformed to serve the function of announcing the time. It is one of the landmarks of Beijing and an important historical building, which is representative of Chinese culture under imperial rule. 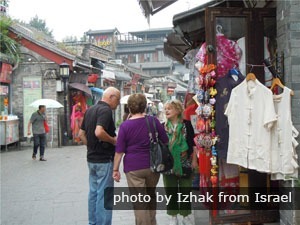 Tourists are shopping in Yandaixiejie Hutong. 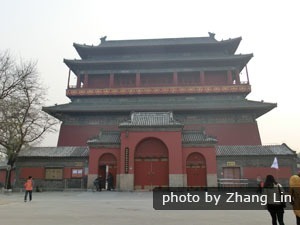 Yandaixiejie (烟袋斜街 /yen-die-sshyeah-jyeah/) Hutong is 100 meters or a 2-minute walk from the Drum Tower. 1. Head south from the Drum Tower for 100 meters. 2. Turn right onto Yandaixiejie Hutong. Yandaixie Street is located at the northern tip of old central Beijing. Since the olden days, Yandaixiejie has been one of the most flourishing commercial areas in Beijing. The stores are closely packed along the street, and a wide variety of souvenirs with distinctive Beijing characteristics can be found there. Guangfuguan (广福观 /gwung-foo-gwann/) Taoist Temple is worth a visit. There are characters carved on the lintels above the arched doorways. The temple&apos;s roof guardians are intact, and religious statues have remained even after the temple was transformed into bars and restaurants several times. Renovation work was completed in 2012, and it is open to visitors once again. Silver Ingot Bridge (银锭桥 /yin-ding-chyaoww/) lies on a narrow channel joining Qianhai (前海 /chyen-high/) Lake and Houhai Lake. The bridge is a mere 40 meters south from Yandaixiejie Hutong, and it is at the southeast of the Shichahai (什刹海 shrr-chaa-high) area, surrounded by hundreds of hutongs. 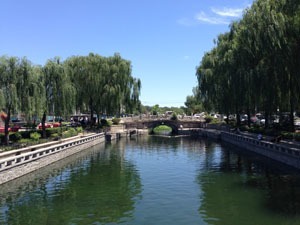 Have a relaxing stroll along the north bank of Qianhai Lake before turning into the Shichahai Pub Street. Lotus Market (荷花市场 Lianhua Shichang /lyen-hwaa-shrr-chung/) is reached at the end of the Shichahai Pub Street, bringing this walk to a satisfying end. There are many pubs and restaurants to get a meal or drink in near this market, named after the nearby blooming lotuses on Qianhai. Experience the cultural atmosphere in Liulichang Culture Street. 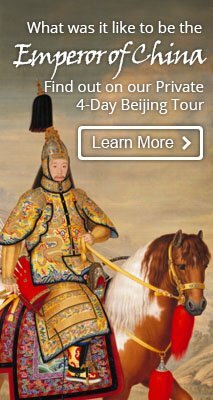 This tour allows you to experience the cultural atmosphere in Beijing and learn about the oldest brands there, helping you understand why they are so popular among Beijingers. In the past, scholars went to Beijing to take the highest imperial examination. Liulichang Culture Street was the place where they gathered to rest and prepare for the examination. As a result, many bookstores, brush shops, and paper shops opened there. As time passed, all kinds of antique shops, bookstores, brush shops, and paper shops opened in this street. 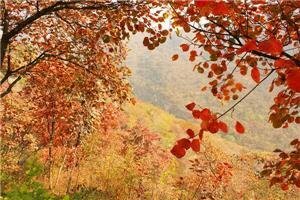 Dashilan is a famous commercial street with a history of 500 years. Most of Beijing’s time-honored brands can be found there. 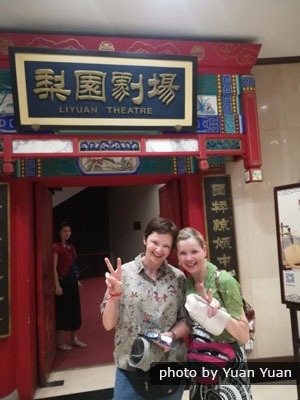 The first cinema in China was established there, and it is still open nowadays. 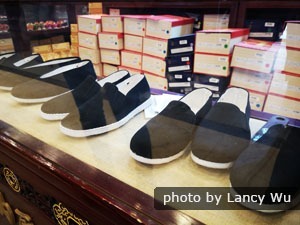 You can see the famous old Beijing brand-name store selling shoes – Neiliansheng – which was founded in the Qing Dynasty (1644–1912). The most famous traditional Chinese medicine pharmacy is also there. Your guide will share stories about the development of these brands with you. By exploring these old brands, you can get a deeper understanding of Beijing’s history and its commercial development. In the early 1950s, there were more than 800 commercial shops in Qianmen Street. It is bustling there. It is characterized by the blend of traditional commerce with history and culture, reflecting the convergence of traditions and fashion. A famous opera house is located there, which is a must-see attraction in Beijing. Qianmen is the last stop of the whole walking tour. If you are tired, you can have a rest at the Starbucks store and from there you can also see the Drum Tower. 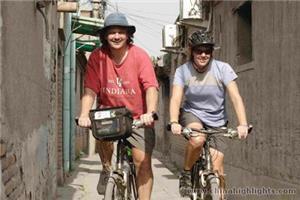 A Half-Day Walking Tour to discover the authentic lifestyle of a Beijinger. Beijing Traditional Food Night Tour — satisfy your taste buds with delicious food. 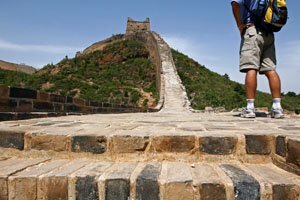 Discover more wonderful Beijing walking tours.